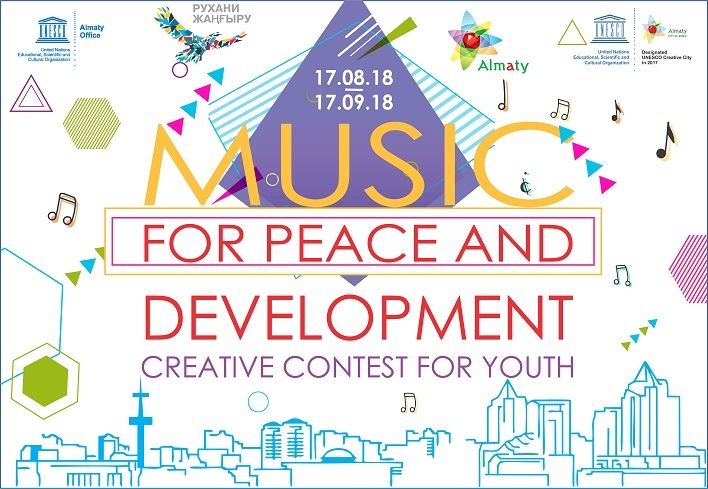 Launch of the youth creative contest "Music for Peace and Development"
The contest provides youth with the platform for demonstration of a role of creativity and culture as the instrument for ensuring sustainable development of the cities. As Almaty is a UNESCO city of Music, this project supports the city’s passion for music culture, and encourages its young citizens to develop and create new projects to advance the implementation of UN Agenda 2030 in cities through music and creative cooperation. The results of a contest for the best youth-led projects on how music can contribute to sustainable development (e.g. music influence on gender equality, inclusion, rapprochement of cultures, interfaith and inter-generational dialogue). The best youth-led project ideas will be announced during the most anticipated youth event "Almaty - Youth Space" on 21 September 2018 and awarded by Mayor Office of Almaty, UNESCO Almaty Office and other partners. 1. "Music for Peace" (ideas for how music can contribute to the strengthening of peace, the development of intercultural dialogue, friendship and tolerance). 2. "Music - Generation CONNECT" (ideas about how music can contribute to reducing the gap between generations). 3. "Music is Our Heritage" (ideas about how you can contribute to the preservation of musical heritage, the inculcation of interest in Kazakh traditional music among young people). To participate, please read the Regulations on the contest and fill out a template of ideas.